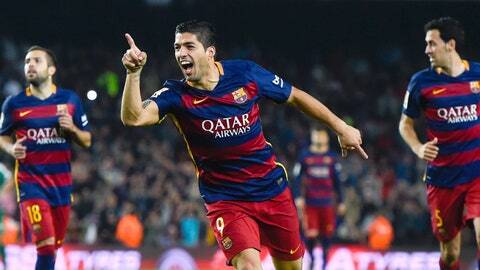 Luis Suarez scored a hat-trick in Barcelona's win over Eibar. Luis Suarez scored a hat-trick as Barcelona came from behind to beat Eibar 3-1 and join Real Madrid at the top of the Primera Division. The Basque minnows took a shock lead after just eight minutes through in-form Atletico Madrid loanee Borja Baston, but Suarez leveled midway through the first half. The Uruguay international struck at the beginning and end of the second period to complete his treble and seal the three points for Barca, who had Javier Mascherano sent off as Eibar suffered their first away defeat of the season. Luis Enrique’s men share the league’s summit with Madrid on 21 points thanks to the win, although they have an inferior goal difference. Before kick-off, Barcelona displayed banners on the pitch proclaiming the right to freedom of expression – a thinly-veiled message to UEFA, who fined the club Â£29,000 last week for allowing pro-Catalan independence flags into the Nou Camp for last month’s game against Bayer Leverkusen. But not long into the game, Barca had pressing problems on the pitch to deal with. Ander Capa fired the first warning shot for the visitors after four minutes but Claudio Bravo was able to make the save. The Chilean had far more trouble dealing with the next attack. Simone Verdi burst forward after Marc Bartra surrendered possession, allowing Dani Garcia a sight at goal. Bravo could only parry the midfielder’s shot and Baston was waiting to shoot into the far bottom corner and silence the Nou Camp. Barca responded soon enough. Sergio Busquets played a wonderful lofted ball towards Sandro Ramirez on the right and the youngster volleyed into the area, where Suarez rose to crash a header into the net. It was the first goal Eibar had conceded in the first half of any game this season, but they showed character after conceding as Verdi tried to catch Bravo from outside the area and narrowly missing the target. The Catalans breathed another sigh of relief later in the half when Eibar’s winger Keko cut in from the left to coast past Dani Alves and shoot at goal, with only the trailing leg of Bartra preventing his shot from creeping in at the near corner. The Basques had been the boldest of any teams to have visited the Nou Camp this season in the league, but they were dealt a sucker punch at the start of the second half. Capa was caught napping when bringing the ball out from the back and was dispossessed by Neymar, who rushed into the area and teed up Suarez to arrow into the bottom corner. The Nou Camp was left stunned by referee Carlos del Cerro Grande’s decision to give Mascherano a straight red card in the 83rd minute for dissent and Barca fans would have been within their rights to fear a late onslaught from Eibar. However, their anxieties were quickly banished by Suarez, who took down another cross from Neymar with his chest and rifled into the bottom corner, scoring his second hat-trick as a Barca player.